Whether you've just started the welcome offers or you're hard at work during the Aintree festival, I Hope you're all smashing it! 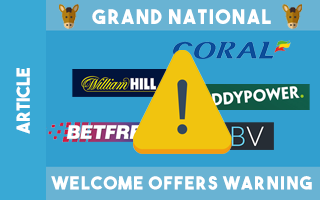 Just a quick one to mention that during the Grand National build up (today and tomorrow), a handful of bookmakers will remove their usual welcome offer. Often replacing it with one with worse value. The reason they do this is because they know they'll get a ton of new registrations for what is the biggest race of the year and feel they don't need to dangle as big a carrot as usual. So be wary of this if you're doing any welcome offers today or tomorrow. Double check the site to see if the offer is still live (if you're unsure feel free to check with us), before signing up to a bookmaker. Please let us know if you find any others that have changed!